The Wellington Hotel is superbly positioned, looking straight out to sea, elevated from the esplanade and within a fairly level walk from the town centre and shops. This beautifully presented hotel has been the subject of a massive refurbishment programme, which has included quality furniture and fixtures and large sun decks which take in the full vista of Ventnor Bay. Facing south, all the bedrooms have luxury en-suite facilities and the hotel offers a very high standard to those guests seeking an idyllic, luxury retreat. 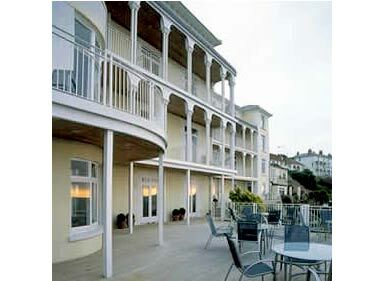 The Wellington Hotel is located in the southern most resort of Ventnor, looking straight out to sea. Ventnor was perhaps the busiest resort on the Island in Victorian times; people were attracted there by the warmer micro climate. Arguably one of the prettier towns, Ventnor is built on the side of St Boniface Down, the Island's highest point. Once inside The Wellington Hotel, you will be impressed by the standard of finish and furnishings which make this hotel so superb. Decorated in neutral colours with stripped and polished floors, natural stone feature walls and of course, the entire original features such as cornices, fireplaces and large windows, which were so typical of The Victorian Era. The Bedrooms of the Hotel are equally as luxurious. All are centrally heated with en-suite facilities and all have quality furnishings, finished in natural wood effect with neutral decorations. Most of the guest rooms have panoramic sea views. The super deluxe rooms have their own private decked balconies. The restaurant and dining room at the Wellington are, as you would expect, also presented to a very high standard. The level of cuisine reflects that of a quality hotel and features locally caught sea food, and delights such as Dorset Downs Saddle of Lamb, succulent steaks and meats, delicious vegetarian dishes & salads, all followed by a superb desert trolley.